The woodpigeon was @SpeciesofUK from 31st March to 6th April 2013. The woodpigeon is a member of the Columbidae family, which contains all 310 species of doves and pigeons. The woodpigeon appears right across the UK and according to RSPB data is our seventh most common bird. In fact, it’s such a common sight now that in 2005 it even topped the BTO’s list of the UK’s most commonly seen birds. Doves and pigeons, or Columbidae, are stout birds with short necks and short, slender bills. 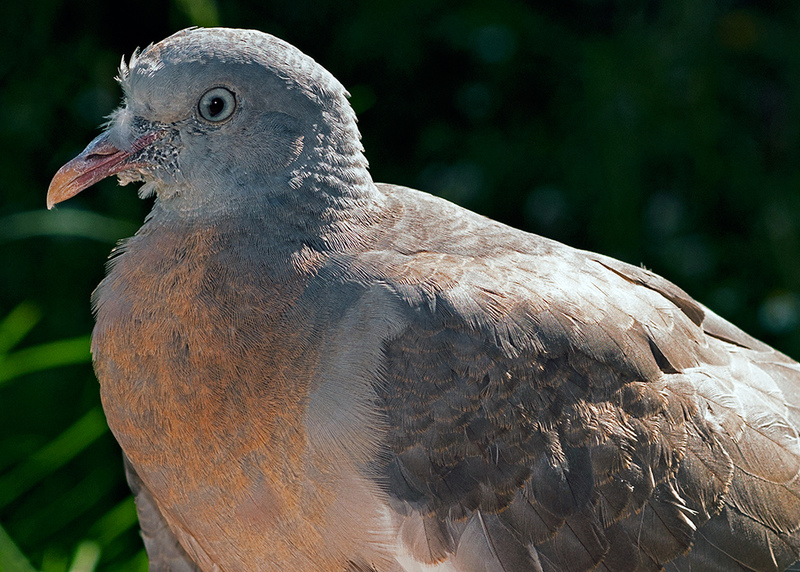 The words 'dove' and 'pigeon' are used interchangeably in species names, although the smaller species tend to be called doves and larger species pigeons. 1. The rock dove (or feral pigeon). 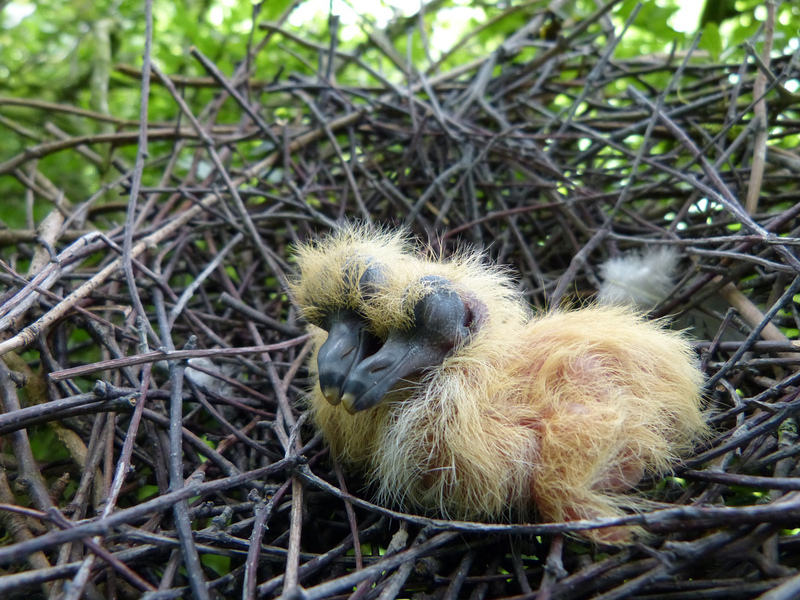 A handful of ancestral wild rock doves are still found on UK coasts. 2. The stock dove. Similar to the rock dove. 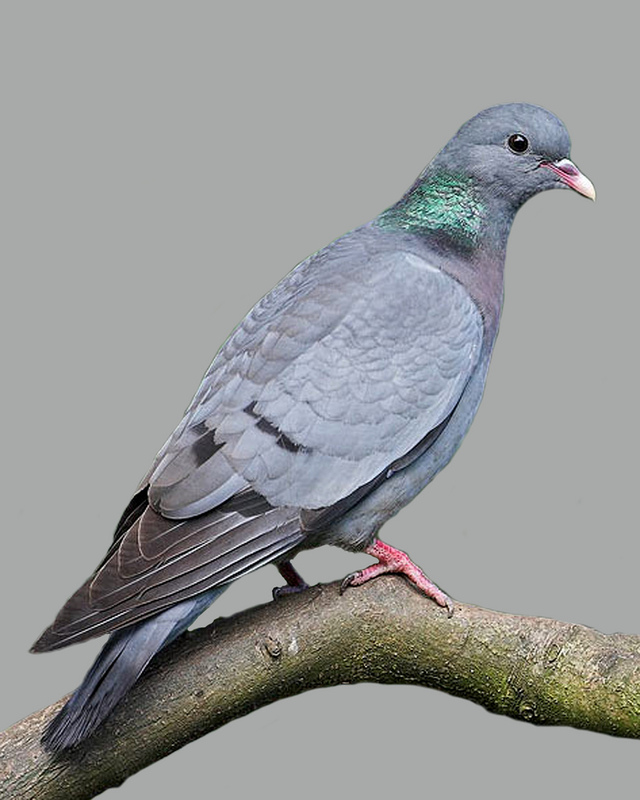 Has an attractive iridescent green band on the back of the neck, black edges to the wing and unlike the rock dove does not have a pale rump. 3. 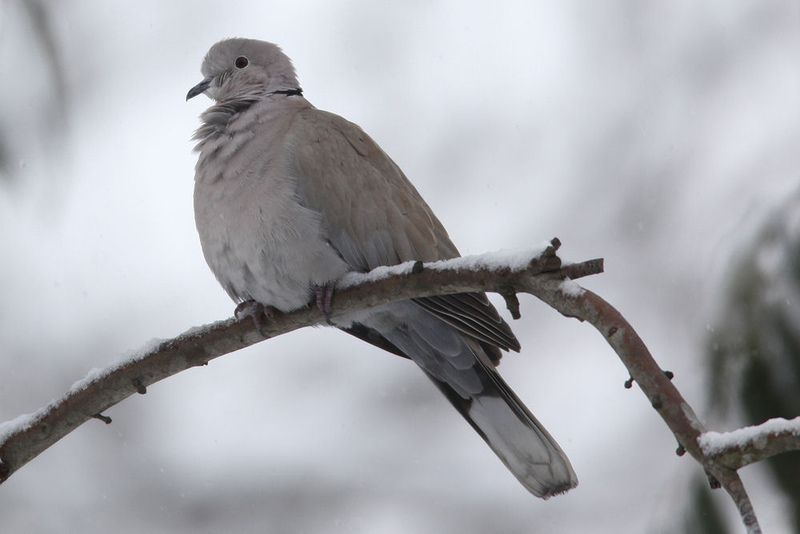 The collared dove. Pinky-grey colour with distinctive black band on the neck and monotonous cooing. 4. 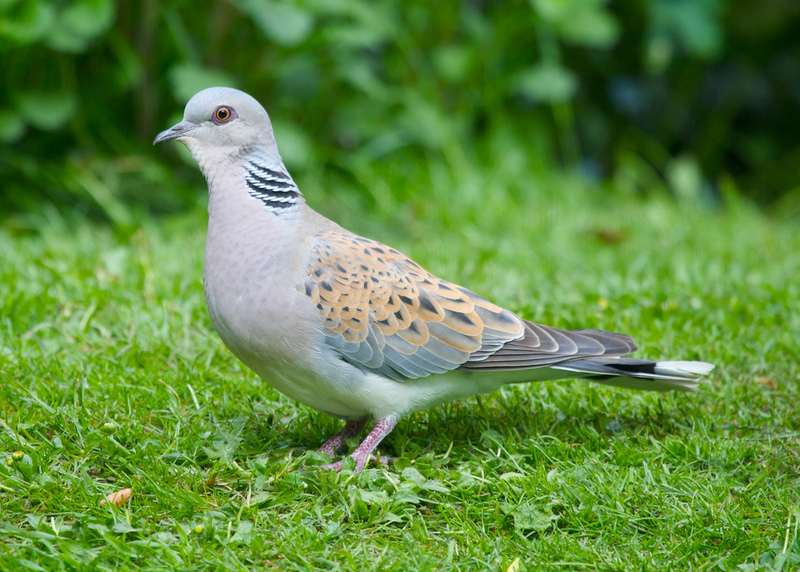 The turtle dove. A dainty dove with a gentle purr. A summer visitor to the UK. 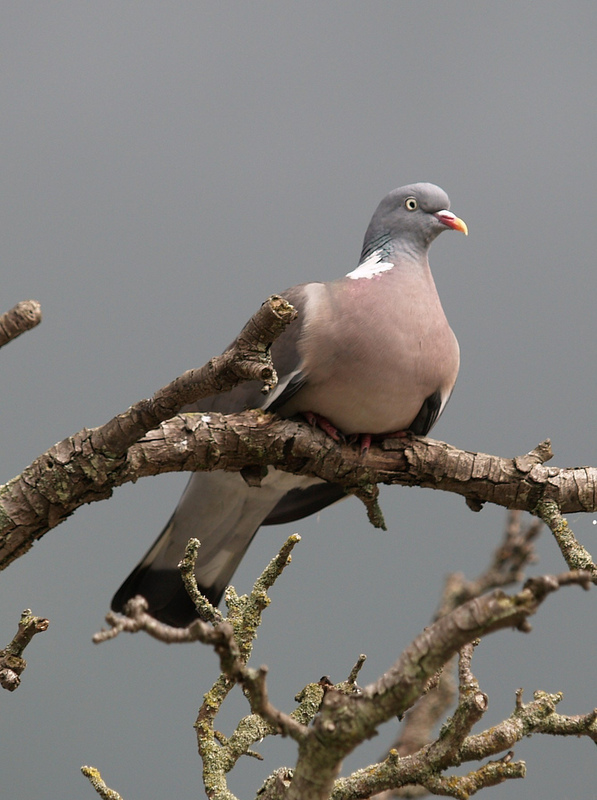 Woodpigeons are grey with a mauve-pink breast and white patches on the neck and wings. The flashes of white on the wings are clearly visible in flight. 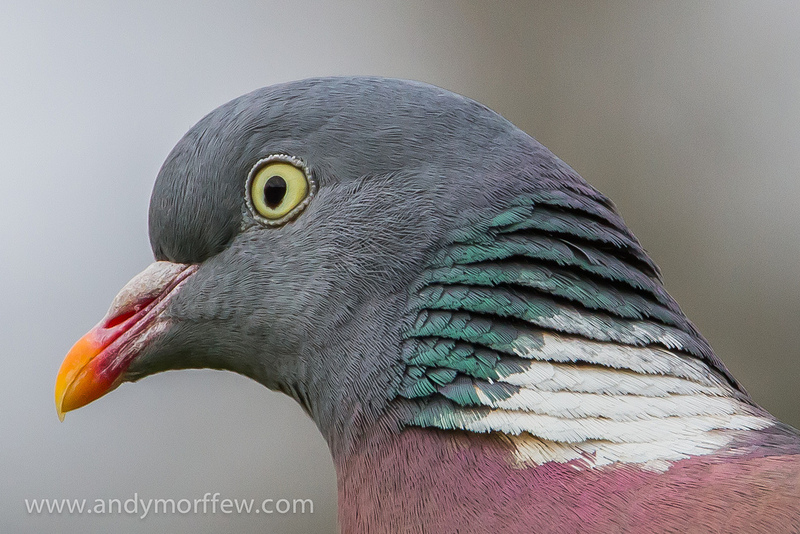 The woodpigeon eyes are greenish white to pale golden, with a narrow grey eye-ring. The bill is pinkish-red at base and yellow at tip, with a white operculum (the fleshy mass near the bill’s base that is common to all doves and pigeons). The woodpigeon neck though is the real highlight of this bird. The iridescent purple/green feathers are sublime. The female is similar but with smaller white neck patches and a duller breast. The juvenile woodpigeon is duller and paler with a pale rusty breast. It lacks the neck patches and iridescences and its eyes are darker, mostly grey with a yellow tinge. The first is its lovely soft coo-ing which has to be one of the easiest bird sounds to learn and one of the most beautiful. The second is the often heard loud clatter of its wings as it takes off or loses control moving along branches. 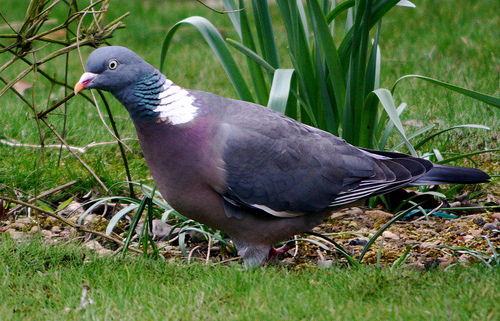 The woodpigeon eats buds, shoots, seeds, nuts and berries. It also enjoys taking crops like grain or peas. As well as plant matter, the woodpigeon also takes invertebrates such as earthworms, beetles, pupae, spiders, slugs and snails. The woodpigeon tends to be shy in the UK countryside but has become tamer where it appears in towns. Woodpigeon courting is a typical behaviour to see during Spring in the UK and is fascinating to watch. The male woodpigeon first conducts a display flight, climbing rapidly, clapping his wings, and then gliding down in an arc. It’s repeated 2 or 3 times. He then conducts an extraordinary bowing display close to the female and fans his tail. This makes the most of his beautiful neck iridescences. 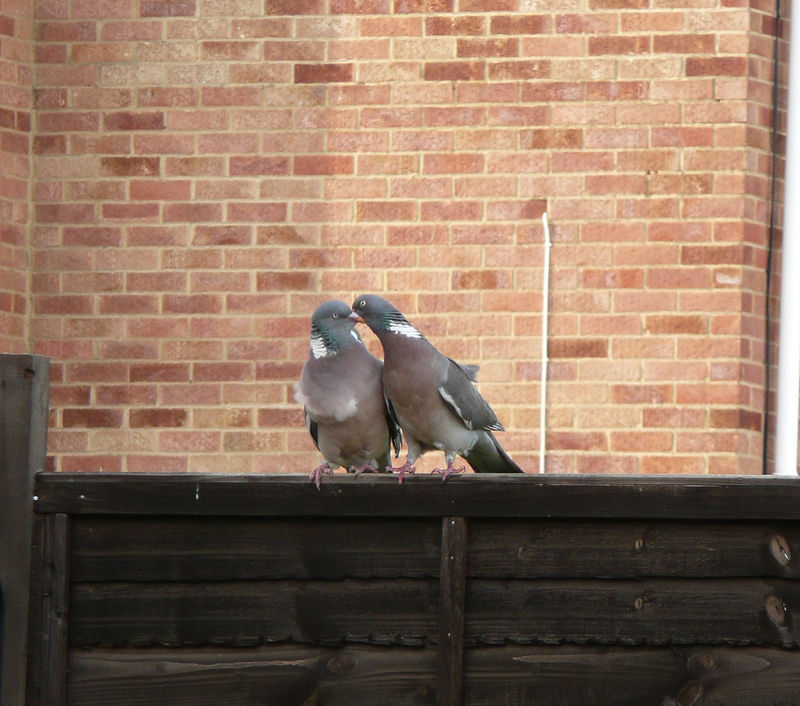 Finally, the courting woodpigeons will neck and preen each other. 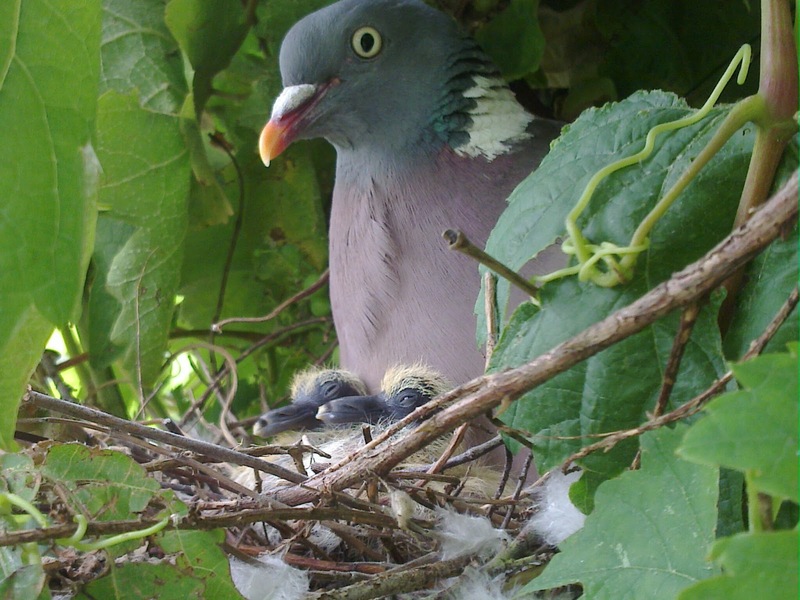 The woodpigeon nest is a platform made from twigs and built by both sexes in a tree or on a building. The first clutch is laid in April and there can be 1-2 broods. 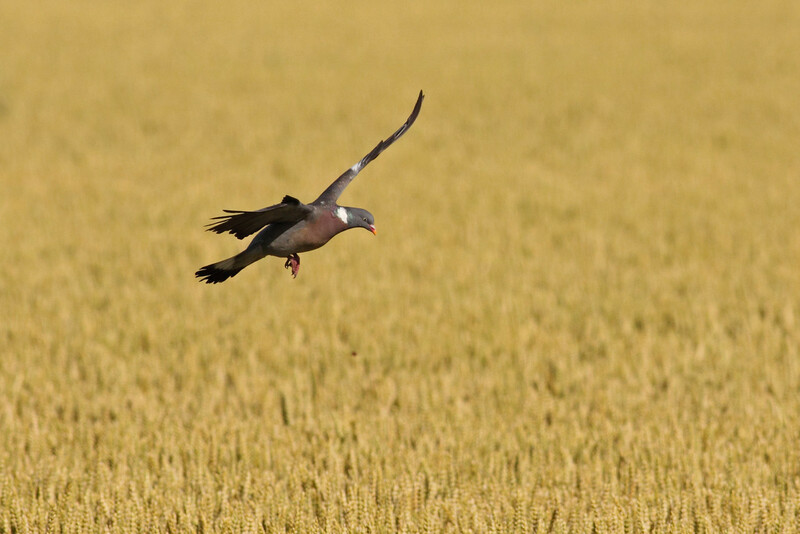 Woodpigeons are considered an agricultural pest bird due to their fondness for eating crops such as grain. They have also long been a popular bird for sporting shooting. 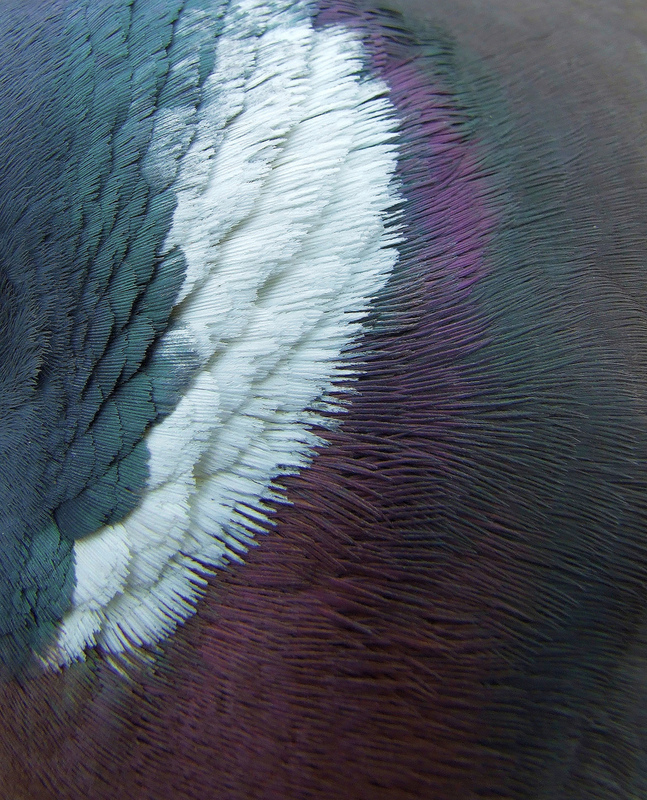 As a result, woodpigeon are commonly shot. UK law authorises shooting for preventing damage to crops and for public health or safety. 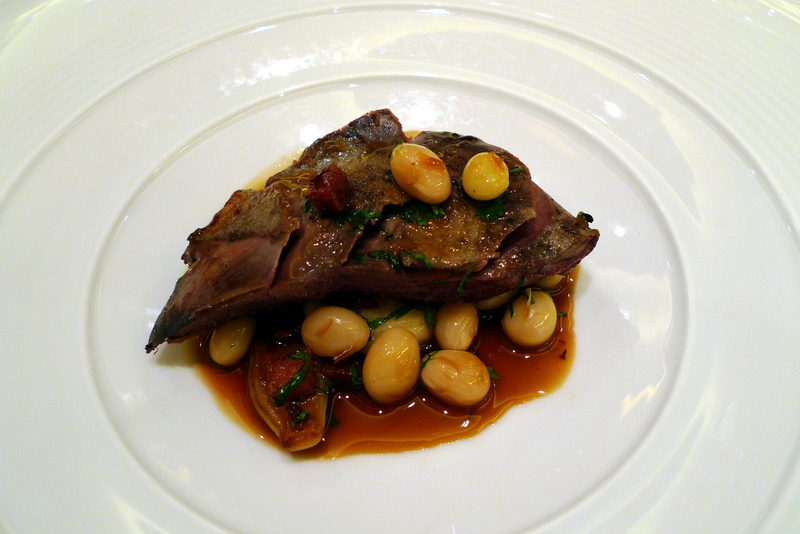 More recently, woodpigeon has become increasingly popular as an eating bird, frequently appearing on the menus of high-end restaurants. It is seen as a sustainable, locally sourced meat. 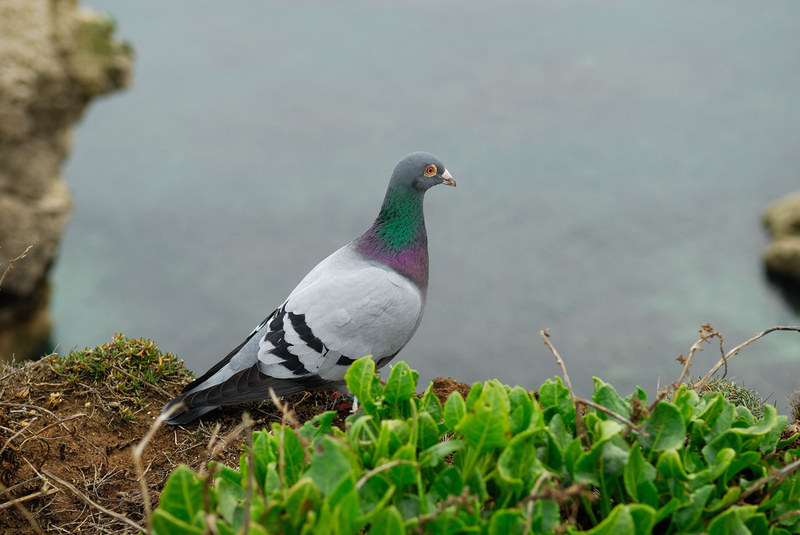 People often think that feral pigeons are one of the UK’s most common birds. 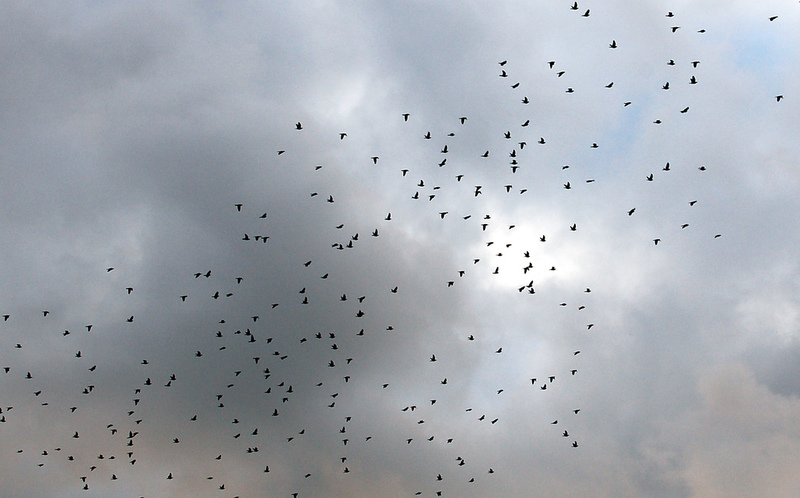 In fact, according to RSPB data, there are as many three times as many woodpigeons as feral pigeons in the UK.